2P START! Live! 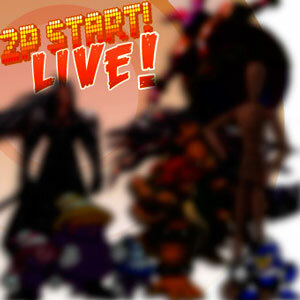 : Boss Battle Edition | 2P START! If you hate videogame music, you’ll hate this podcast! On the other hand, if you’d like to know Tim & Ray’s favorite boss battle music of all time, by all means, listen in. Plus the usual, Trivia for You, Comic Talk, and the dreaded Black Doom Award. Check it out! His name is Oshus, and he is the swordmaster on Outset Island in Wind Waker! Sorry, I would have loved to do a comment of the week, but first of all, the podcast was already getting pretty long, and second, we (meaning I) had LOTS of technical difficulties again with my internet connection. We actually had to record it in 4 sections because our Skype conversation kept getting cut off. Anyway, my pick for comment of the week would have been sicsided’s link to the article about the huge Pac-Man someone really did put on the road in Minnesota. I thought that was awesome! I’ll admit though, you and DJ had a good little investigation going into the slaying of Pac-Man. Ray, be a man and admit your sins! hyper,Sorry, I would have loved to do a comment of the week, but first of all, the podcast was already getting pretty long, and second, we (meaning I) had LOTS of technical difficulties again with my internet connection. We actually had to record it in 4 sections because our Skype conversation kept getting cut off. I’d just like to state that…..I don’t like Final Fantasy. I played VII, X, IV, and I; I just don’t like them, nothing personal, just not a big turn-based RPG fan. But my dislike of Kingdom Hearts is another story ………..I’m just gonna say it cause everyone is thinking it: Black Doom has the best Boss Battle Music EEEEVAAARRRRR!!!!!! I just looked up Black Doom…..did anyone know his voice actor is the same guy who voices Goku in DragonBall Z/GT!?!?!?!? Been listening to your podcast since the start really good, loving the comic too :). I have to say that my favorite boss song of all time has to be the song at the end of Guitar Hero 3 in the battle vs Lou (The Devil Went Down to Georgia – Steve Ouimette) is just very funky and just seemed to be very very suiting to me. If the Zelda song isn’t Wind Waker I think it sounds more like Phantom Hourglass, also I’m sure the other one is from Sonic CD in the Paradise or Palmtree Panic stage (something with two P’s and the first stage) at the present time period on the American version of the game. Also great podcast, I mostly came for the silly comics ignoring the podcasts but now that I’ve listened too one I’m going to listen to the others as well. No, I remember the present music now, I’m sure it was the past or good future. Since its so hard to get to the good future at that part in the game I’m very sure its the past. Its from LOZ:WW when you are inside a house. P.S.S. Don’t feel bad ray, I’ve never played final fantasy either. Well I fell stupid now. Link to the Past. Boss battle music. That’s my favourite boss battle music. I am obsessed with that game. Its such a short song and so unsubtle, but its so epic..
Brap brap brap! Brum brum brum!